Come aboard for more military justice and non-stop action as all 24 episodes of JAG's fourth season arrive on DVD for the very first time! Their search for the truth takes the JAG team of lawyers around the world, but what happens at home this season rivals any investigation. Harm Robb (David James Elliot) considers leaving "Mac" (Catherine Bell) behind when his dream of becoming a pilot is realised, just as Admiral Chegwidden (John M. .. The military series JAG soars to dramatic heights in its sixth season on DVD! When Judge Advocate General lawyer "Harm" Rabb (David James Elliott) travels to Russia, he receives shocking news - he has a younger brother! Meanwhile, back in Washington, "Mac" MacKenzie (Catherine Bell) becomes engaged and plans her wedding, until Harm boldly makes a confession, forcing her to question her decision. And, sadly, tragedy strikes Bud (Patrick .. This Boxset has 54 Discs. The cases of Harmon Rabb, former Navy fighter pilot, and his fellow lawyers of the US Navy's Judge Advocate General's office. SEASON 1: Pilot Shadow Desert Son Deja Vu Pilot Error War Cries Brig Break Scimitar Boot Sightings The Brotherhood Defensive Action Smoked Hemlock High Ground Black Ops Survivors Recovery The Prisoner Ares Skeleton Crew SEASON 2: We the People Secrets Jinx Heroes Crossing the Line T..
Get ready for action, adventure and suspense in Season One of TV's longest-running military drama, JAG. The first season of its 10-year reign introduces former flying ace Harmon "Harm" Rabb of the Navy's Judge Advocate General. Now an attorney, Harm investigates, prosecutes and defends military criminals in cases that often take him behind enemy lines...both in Washington and overseas. Catch the action from the beginning with all 21 epi.. The action heats up as Jag returns for all 15 episodes of its explosive second season! JAG lawyer “Harm” Rabb (David James Elliott) gets a personal and professional boost when he's partnered with a beautiful, by-the-book marine, Sarah “Mac” MacKenzie (Catherine Bell). This classic duo, a fan favourite, will investigate crimes in the military for many seasons to come. And with Admiral Chegwidden (John M. Jackson) now anchoring the JAG of..
Own JAG Season 5 DVD from Deff, DVD, Blu-Ray & 4K Video Specialists - Free UK Delivery.. The hit series JAG returns with all 24 explosive episodes from its Seventh Season, on DVD for the first time ever! 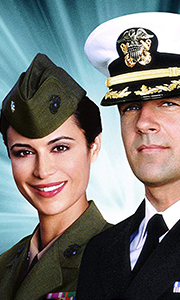 This season, Judge Advocate General lawyers “Harm” Rabb (David James Elliott) and “Mac” MacKenzie (Catherine Bell) both find themselves single again, as they re-explore their relationship while on missions in the Indian Ocean and in post-9/11 Afghanistan. And as Admiral Chegwidden (John M. Jackson) welcomes new attorney Stu..
JAG is back with all 24 episodes from its Eighth Season - on DVD for the first time - including a two-part murder case that launched the blockbuster series NCIS! This season, Judge Advocate General lawyers Commander Rabb (David James Elliott) and Lt. Colonel MacKenzie (Catherine Bell) travel to Paraguay, where Mac poses as the pregnant wife of a CIA agent. And as Admiral Chegwidden (John M. Jackson) becomes engaged and Harriet (Karri Tu..